Rose, whose career has been dogged by serious knee injuries, initially hurt his ankle on October 20 in Milwaukee. He's made seven starts with the Cavaliers. Derrick Rose ended his self-imposed separation from the Cavaliers. The point guard, who has been dealing with a sprained left ankle for much of his first season with Cleveland, returned to the Cavs on Monday to resume rehab and treatment. A frustrated Rose had left the team on November 22 to contemplate his future, but he's back and working toward a return to the floor. Rose had been in contact with coach Tyronn Lue and general manager Koby Altman in recent days. The conversations were described as "positive," and the team said he will report to its Cleveland Clinic Courts training facility. There is no timetable on when he'll play. "This has been a very challenging and difficult time for Derrick," Altman said. "We will continue to provide him with support and have patience as he re-joins his teammates and works his way back on to the court." Rose, whose career has been dogged by serious knee injuries, initially hurt his ankle on October 20 in Milwaukee. He's made seven starts and is averaging 14.3 points and 26.9 minutes with the Cavs, who signed him to a one-year, US$2.1-million free-agent contract this summer. The three-time defending Eastern Conference champions anticipated using Rose as a backup to Isaiah Thomas. However, with Thomas continuing to recover from a hip injury, Rose was thrust into the starting lineup to start the season and showed flashes of his All-Star form while dealing with the sore ankle. "Everyone's happy that he is back," Lue said. "All the players are happy and excited that he's back, as well as the coaches and the front office. We're just glad that he's in a good place right now. We're just happy to have him back. No hard feelings." Rose's minutes could be affected going forward. Thomas is expected to return in the next few weeks and Dwyane Wade has been playing well running the point for Cleveland's second unit. The Cavs had won 11 straight heading into their game on Monday night in Chicago, where they also won 113-91. Rose spent seven seasons with the Bulls. The 28-year-old has averaged 19.4 points, 5.9 assists and 3.7 rebounds since being taken as the No. 1 overall pick in 2008. "Everybody goes through good or bad times," guard Jose Calderon said. "It's perfectly understandable. ... All we want is him to be happy and be back and that's great news for us and for him. We support him in any way he needs us to support him." 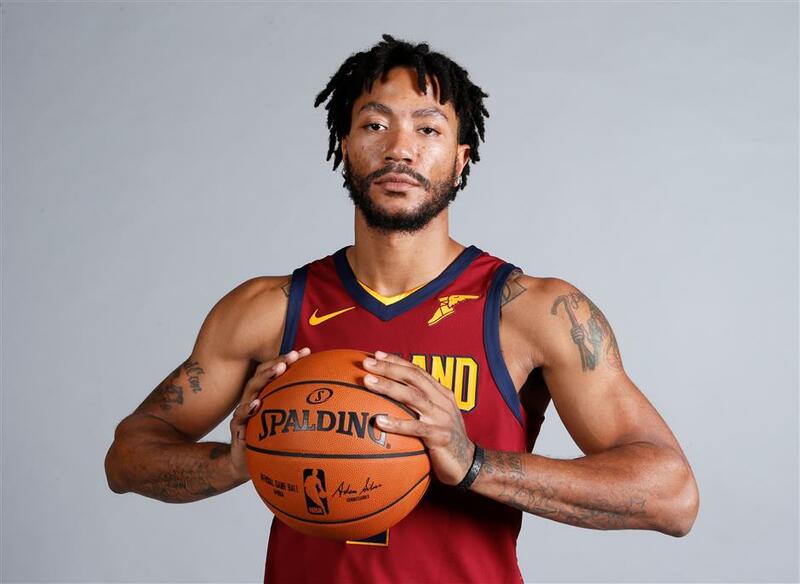 Cleveland Cavaliers point guard Derrick Rose poses for a portrait during the NBA basketball team media day, in Independence, Ohio, in this September 25, 2017, photo.